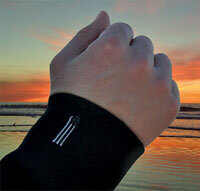 Sensors printed onto the sleeves of wetsuits could alert the wearer to contaminated water. Navy divers could also use the sensors to locate underwater explosives, such as mines. Joseph Wang at the University of California in San Diego, US, and colleagues have demonstrated that their sensors can be printed directly onto neoprene, a synthetic rubber commonly used in wet- and dry-suits. 'Such a built-in sensor will obviate the need to carry a portable analyser for underwater detection,' says Wang. The team printed a silver/silver chloride-based ink onto the neoprene to give a conductive layer and reference electrode. Using a carbon-based ink, they printed a second layer to form working and counter electrodes. An insulating ink layer was printed over these, leaving the contact pads and upper segments of the electrodes uncovered. To detect toxic phenols - pervasive industrial organic pollutants - the team mixed the enzyme tyrosinase, which is selective towards phenols, into the carbon ink, printing it over the working electrode. The three-electrode sensor was controlled with a miniaturised potentiostat containing a three-volt battery encapsulated in a watertight compartment integrated into the wetsuit. In safe conditions, a green light was shown, but when the phenols were detected, a red LED was switched on instead. The team used a similar warning system to detect the explosive TNT and heavy metals such as copper. The sensor was tested under repeated bending and it continued to function properly when deformed. 'Most chemical sensors and biosensors are produced on rigid substrates; they're not normally put onto a flexible substrate and then tested for effects of bending. The preliminary work looks promising,' says Dermot Diamond who studies sensors, environmental monitoring and smart materials at Dublin City University, Ireland. 'Anything that introduces a chemical sensing or biosensing capability into a fabric, particularly for a fabric that's designed to be worn at sea is of great interest,' he adds. Wang now aims to improve the sensor's long term stability under continuous underwater use and plans to fully integrate the electronic control.